What I'm writing: Mixed bag. Edits for When Danger Calls, Revising Chapters 12 and 13 for Randy & Sarah's sequel. Mostly it's emails and data entry for work. The deadline is tomorrow, so I'm hoping things ease up. I should collect the excuses people use for their last-minute requests for special treatment. Tonight, the alumnae of the Civilian Police Academy have been invited to observe a Labor Day DUI checkpoint (I think they invited us because we bring food). It's too hot to bake, so they're getting store-bought this time around. I thought it would be interesting to watch police procedures, but the checkpoint runs from 9 PM tonight until 4 AM tomorrow. Maybe I can pick up some bits for future scenes. At the preliminary explanation of the event last month, the deputy told us how stupid some people can be. First, by law they have to post warnings that there's a checkpoint ahead, so anyone with half a brain would turn around right there if they were doing anything suspect. Second, also by law, all they can do is ask to see a driver's license. From that point, they're free to look into the vehicle and if they see anything questionable, they can make an arrest. So, one bright driver, when asked to show his license to the officer, says, "Sure. Hold my beer and I'll get it for you." And proceeds to hand the deputy an open can of beer. Now, if I put that in a book, would anyone believe it? The Romance Studio gave Starting Over Five Hearts in the review it posted today. What a wonderful first review. Odell’s characters are complex and endearing. Colleen can’t stop thinking like a cop, even though her experiences have left her with nightmares and insecurity. Graham is a good-looking ladies man who is suddenly feeling protective and confused. And he can cook. Both are complex, likable and clearly drawn. Harrigan’s new boss is both gruff and understanding. And Colleen’s new best friend Tracy helps her face up to the truth about herself, and a lot about men. The reader is left wanting to know more about all of them. The mystery itself is both satisfying and complex. Real estate fraud, computer hacking, and birdwatching all play a part. The conclusion is both believable and highly moving. This is extremely well-written and a highly recommended read. What I'm writing: Chapter 13. "Failure to Plan on Your Part does NOT Constitute an Emergency on Mine." The organization I work for has a Biennial Conference in late November, and their early registration deadline is this week. I handle memberships, and of course, members get a better registration rate, so everyone's clamoring to get their applications processed. Since I'm a part time, work-at-home consultant, and am only supposed to work 10 hour weeks, I shut down Friday afternoon. It's not like these folks didn't have plenty of time to take care of this months ago. So, I spent the weekend with my characters. And yesterday dealing with procrastinators who all want special treatment. What I'm writing: Chapter 11, scene 2. This morning, I performed an annual ritual. I went to the closet, up on that high shelf under a pile of "don't want to throw it out, but don't really need access to it" stuff, and took out the dusty box. Inside, in its protective plastic, is the heavy white album with "Our Wedding" embossed on the cover. I open it and time does an immediate reversal. Tears spring to my eyes as I see my late grandparents walking proudly down the aisle. Little did I know how soon they would depart this earth. And my father-in-law is there, too, tall and a bit uncomfortable in his city finery. My parents, on the other hand, have hardly changed—except for the clothes and hair. Curls piled on top of Mom's head; long sideburns on Dad (which despite the passing years still remains the same almost-black). My brother's smile hasn't changed a lick, as he stood in as "best boy", barely old enough to be a legal witness, but it between it being field season and military obligations for so many of my husband's circle, he was the only one who could be counted on to be there. He's still got all his hair, too—although a bit more gray than our father. Thanks for the genes, Mom & Dad! And to Mom, for saving the dress all those years—both daughters used it. You got your money's worth. 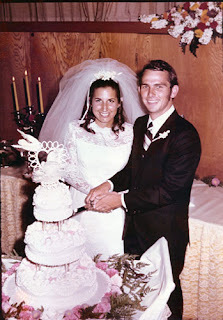 Because I know my husband reads this, I'd like to take this moment to say, "Thanks, honey, for thirty-eight years. And yes, I, too, would do it again." I knew he didn't have the good hair genes and it didn't stop me then. Bald is beautiful. And, thanks to Photoshop's ability to take those old, faded pictures and make them look new, here we are. If only there were the same kind of buttons for us in the flesh. My writing has slowed to a crawl for a variety of reasons: some new plot ideas; reading a book that makes me afraid the author's voice, which I envy to the nth degree, will bleed over into mine, so I have to step back and read something entirely different. Or, it's just plain hot. I've never really adjusted to the Florida climate. I grew up in the more desert-like environs of Southern California, and humidity is NOT my friend. So, today I'm going to share something I found tucked away in my computer. ~ Hot water now comes out of both taps. ~ The temperature drops below 95 and you feel a little chilly. ~ You break into a sweat the instant you step outside at 7:30 a.m.
~ The cows are giving evaporated milk. The good news? August is almost over. The bad news? September is usually hotter. Congratulations! Please email me (address at the right, or via my website link) with your address and I'll get your prize to you. One comment I've heard over and over about my books is, "Gorgeous Covers." Today, I'm pleased to share this space with Syneca, the artist who's created so many gorgeous covers for EC and CP books. As authors, we fill out a 'cover request form,' and then sit back and hold our breath. What happens between sending in that form and having a cover to display? I asked Syneca to share the process. The first thing that happens when the Graphics Department receives a cover request is that Will, our cover liaison files it into a folder for me. I read the request and then either assign it to an artist (including myself). In the case of Starting Over, we went through a bit of a refining process to get Terry's vision correct, but once we understood the feel of what she wanted I knew what would work. I'd taken some shots of an eagle in my back yard in the spring and one of them was perfect for the cover. Will and I scoured around through all of our photo resources and found two women that I used to create the woman in the background. (One for the face and the other for the hair). Once I had the cover completed I took it to my boss, Exec. VP Darrell King. In case you all don't know, Darrell is to cover art what Yoda is to the Jedi. A master baby!! He can spot a problem in a cover in a nanosecond. The man has an amazing eye along with being an extraordinary artist. In this instance, Darrell gave the cover the green light and it was a go. We did some tweaking with color and focus and everyone was happy. I have to say that as a general rule of thumb most of the writers for CP and EC - and now Lotus Circle, are easy to work with. Normally authors are a bit apprehensive on their first cover and tend to be a little less trusting of the artists. Once they have a book under their belt, they relax and start to trust us. Some of the writers are so trusting they just send a character description with a synopsis and say "wow me". LOL, we try and I have to say that I love it when we're allowed such creative freedom. It enables us to really do what we do best and that is create covers. We love getting suggestions from authors and to be honest, there are a lot of authors who have incredible ideas and combining creative talents with them is a lot of fun. We do sometimes run into difficulties with cover requests. Sometimes things authors ask for just are not possible. It's not like we can rush out and do a photo shoot for each and every cover. When that happens I'm straight up with the authors and find that being straight with them and working on a variation on the original theme often produces great results. Some things like backgrounds or landscapes, or even sets we can do on the fly. We're always digging into the prop box (things we pick up from flea markets, garage sales, and even a couple of times stuff that people are just throwing away) and setting up a table or desk in front of a window or a photographic backdrop and shooting background stuff for a cover. Or running outside and getting shots of trees or cars or the sky. I tried staying up one night to get shots of the meteor shower but fell asleep sitting on the patio waiting.We have some amazingly talented people working for and with us. Staff and freelance all, they are a great bunch of people. We use photos we take in-house at our own shoots, stock photos we purchase the rights to, and have a fabulous photographer, Les Byerley, who does photography and covers for us. As a rule, we do all of the title work in house. We're a bit picky about the kind of fonts we use and text placement, so normally artists turn in covers without titles and names. When those come in, I do the titles. All covers from the artists come to me. If I feel they're ready to be shown to Darrell King, then I do so. If they need work, I ask the artist for the changes I see that need to be made. When the cover meets my approval then I present it to Darrell. If he deems it worthy then it's a go. If he sees changes that need to be made, then I go back to the artists and we work on making the changes. Leave a comment and I'll give one lucky poster a copy of the cover for Starting Over. I'll announce the winner on Monday, so be sure to check back. Starting Over -- RELEASE DAY! Today's the day. I've learned the Cerridwen site isn't updated at the stroke of midnight, and am waiting patiently -- ok, moderately patiently, if I can be forgiven for two adverbs in a row -- for Starting Over to show up. Meanwhile, there's a new Free Read on my website. Every couple fights now and then, and Colleen and Graham are no exception--even though they're not even a couple yet. Take a peek at their first spat. It's in the Free Reads section -- "Their First Fight." Then, keep checking the Cerridwen site for the official release. Here's another taste of Starting Over. This is Graham's first POV scene. If you want to catch up, the prologue is on my website in the Free Reads section, and the start of Chapter 1 is here. Deputy Graham Harrigan sat at his computer in the sheriff’s office, the normal sounds of office activity fading to white noise as he hunted and pecked his way through the report he needed to file. As he’d told himself countless times, he needed to take a keyboarding class so he could get through the drudgery faster. The smell of stale, burned coffee permeated the room and he wished he’d taken a few minutes to stop at Starbucks. Graham looked up at the sound of his name and saw Jerry Clarke’s midsection precede him into the room. Graham’s jaw clenched. “Some of us don’t run for the john when the office needs extra help.” Heat rose in his face and he refused to turn to meet Clarke’s eyes. He watched Clarke leave and admonished himself for letting the man get to him. Still, Graham knew if Clarke got the CID slot, it was unlikely another would open in time and he’d have to requalify. Clarke had unlocked that place inside where Graham kept his doubts. He’d been promoted three years ago, qualified for CID, but until there was an opening in the Criminal Investigations Division, all he could do was wait. He turned his attention back to the screen. Finally satisfied, he hit “Save” and “Print”. Being a team player had to count. Or so he’d thought when he’d volunteered to cover the check on well-being call. He dug through the papers scattered on the desk, found the number he needed and dialed the phone. “What did you find?” There was an unexpected edge to her voice. He gritted his teeth before he replied. “I’ll be in touch.” He hung up the phone as gently as his irritation allowed. Right quick, she’d said. Like hell. If he turned this over to the detectives, it could be weeks. No foul play, nothing out of place. This would sit at the bottom of their piles. Maybe he’d see what he could do on his own first. Besides, almost anything beat pointing a radar gun at tourists. He started clicking through databases. The house and cottage were owned by Jeffrey Walters. No mention of a Doris. Property taxes were paid in full. No record, wants or warrants on either of them. Jeffrey seemed to be self-employed. A land developer, so travel wouldn’t be unusual. DMV records showed a Buick Park Avenue registered in Jeffrey Walters’ name, the one he’d seen when he’d peeked in the garage window earlier. Graham bounced it around his brain for a minute or two. If the guy was missing, why was his car in the garage? No, still too many possibilities that didn’t mean anything. Walters might have taken a cab to the airport, or someone drove him. Hell, the jerk was probably away trying to buy up some property so he could build a bunch of condos or time-shares. Everything hush-hush, get in before anyone else found out, like Walt Disney had all those years ago. He shook his head, told himself to keep an open mind. He’d never get assigned to the Criminal Investigations Division by jumping to conclusions. Start with the basics. The man was single. Probably off for a bit of R and R with a woman and they took her car. Look for a woman. A woman. What about Colleen McDonald? He found himself smiling involuntarily as he thought of her. He’d like to find a reason to talk to her again. The way she’d looked, bundled in that plaid robe, almost standing at attention when she spoke to him, yet with an air of defiance. Her fair skin sported a light sprinkling of freckles and he’d bet when her hair dried, she was a glorious redhead. A natural redhead. Especially with her bright green eyes. Tall, about five-eight in her bare feet, but making allowances for the dark circles and haunted weariness in those eyes, he’d say mid- to late-twenties. Graham shook his head. He wasn’t used to being rebuffed. Quite the opposite in fact. Women usually went for the uniform and if that wasn’t enough, he’d turn on the Irish charm. He’d discovered most people, especially innocent ones, tended to babble when they spoke to the cops. Colleen had given him no more than absolutely necessary. Experience with the law, perhaps? He’d check her out. As he went to enter her name in the database, he realized he wouldn’t have to make up excuses to see her. He had a name, but hell, he hadn’t even asked her how she spelled it. Okay, there were only two choices, but any excuse worked for him. Graham pushed away from the desk and went in search of Sergeant Briggs. “Thank you, sir,” Graham said. After speeder duty, he’d grab a quick bite at First Watch, which would put him minutes away from the Walters’ house. Melinda might be working the lunch shift. But instead of Melinda’s face, he saw Colleen’s, with those haunted green eyes. Laughter erupted from the squad room. The sound of his name, coupled with Clarke’s guffaws, eradicated Colleen’s image like windblown storm clouds. Damn it. It had been five years. He was a damn good cop and he was going to beat Clarke into CID no matter how many times the man tried to dredge up his past. There's a new free read on my website. I guess it's obvious I'm not sure what I'm doing here. I sit in the chair she indicated. "Um…Terry Odell said you're expecting me?" I don't tell her my recorder's been running since I hit her receptionist's office. Old habits die hard. Instead, I pull it out of my sport coat's pocket and make a show about fiddling with the buttons. "Might save time," I say. She gives me another smile. Broader. White teeth flash. Definitely some interest there. I look a little closer. Light brown hair with gold highlights. Blue eyes, small nose. Slender figure, nice breasts. I give her a polite smile back, not wanting to get into that game. Terry explained Desmond Morris' Twelve Steps to Intimacy while we were working on the book, and this interview isn't going past step three, so when she makes room for my recorder, I'm damn careful not to touch her hand when I set mine next to hers. It hits me, then, like the baton I carried when I was a patrol cop. Terry's ruined other women for me since the Starting Over gig with Colleen. You can read the rest on my site. Coming August 16th from Cerridwen Press. Graham Harrigan cooks when he needs to clear his mind. He's agreed to share some of his recipes with my readers. You can find his first, for buttermilk pancakes, on the Free Reads section of my website. What I'm writing: Chapter 8 of my WIP, and making revisions on Dalton & Miri's story. Last week, our chapter hosted a workshop by author Debra Dixon, and she joined a group of us for dinner the night before her session. As we ate, she put each of us on the spot asking for the best and worst things about the way we wrote. There were almost as many responses as there were people there, but it did force me to think about what I'm really doing when I write. Some spoke of specific points, such as dialogue, or description as strengths or weaknesses. After some consideration I realized that because I love character-driven stories, I tend to spend far too much time on the page with them. I can put my characters on the page, and they'll talk and talk and talk—about everything, and too many times it's not something needed for the plot. That's probably why my first writing mentor said, "You write a beginning, a middle, more middle, and more middle. Wrap it up!" My strength, at least as far as being a "writer" goes, is probably that I can sit and write for long stretches of time, and usually produce a halfway decent word/page count at the end of the day. Where some folks said they were too easily distracted by the chores of everyday life, I see from the other side. If I wasn't writing, I'd have to deal with laundry, ironing, grocery shopping, cleaning…the list goes on, and none of it includes anything I really like to do. For me, it's a no-brainer. After dinner, we convened at the Barnes & Noble across the street where Deb conducted a mini-session on first chapters. Getting started is usually a problem, since I don't plot much in advance. Starting with deciding whether or not your opening scene begins with the characters already there or making an entrance, and moving on to what should be included in that chapter, and who's point of view to use, she had us all eager to get home to our manuscripts and see if we were on target, needed to tweak, or do a massive rewrite. I'm also not a big fan of prologues. They're usually nothing but back story or full of characters who aren't even in the book itself. The book itself has to stand on its own merit. 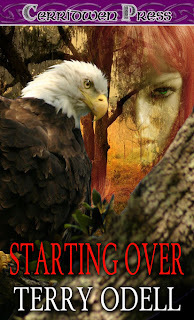 Starting Over was the second book I wrote, and for a while, it looked like it wasn't going to have Finding Sarah behind it. I debated whether to keep the prologue, call it Chapter 1, or ditch it altogether and try to weave in the back story. However, once Finding Sarah was accepted, my editor urged me to include the prologue, as it would tie the book to Sarah's. Next time: I had the pleasure of attending a workshop with Debra Dixon this weekend. I'll post some of the highlights later. Please check back. Less than two weeks until the August 16th release of Starting Over. Although it's my third release with Cerridwen Press, it's the second book I wrote. Colleen McDonald, a character in Finding Sarah, insisted on more page time. I felt bad since I'd cut so many of her scenes out of Finding Sarah that I gave her a book of her own. I'll be posting bits of interest on my website and here as the release date gets closer. If you haven't read Finding Sarah, there's plenty of time before the 16th! If you have read it, drop me a line (honor system) and I'll send you a quick, whimsical short-short. My email address is to the right of this page, and there's a link on my site. There are two free reads with Colleen on my site. You can get there via the Links column on the home page. What I'm reading: Same as last time. What I'm writing: Chapter 6. A new month reminds me once more of how much we depend on technology, and on timing. I've switched web hosts, and things don't work exactly the same under my new system. I try to update my site with new announcements, contests and free reads. However, I'm more of a 'brute force/trial and error' programmer when it comes to things like that. I still need to find out how I can use the services of my new host without having to redo my entire site. And, of course, my son the web guru is on vacation in Cabo this week. And Blogger is having 'technical difficulties' so posting this has been delayed. Please stop by, and if you can find any glitches, pop me an email. Enter my contest. Say Hello. Let me know I'm still hooked up to cyberspace!